One of the most common examples of this selective absorption in biomedical photoacoustic imaging is to differentiate between oxygenated and deoxygenated hemoglobin. 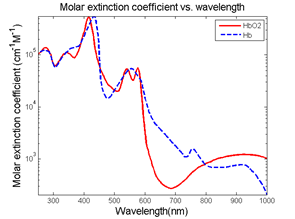 As you can see from the figure below there is a stark difference in the absorption coefficient in the near infrared region of the spectrum; therefore, by utilizing a tunable pulsed laser such as an optical parametric isolator (OPO) as the excitation source oxygen content is mapped. The ability to quantitate oxygen saturation is of particular value when imaging vasculature and tumors, due to its importance in determining several different physiological properties. Additionally, when compared to other optical imaging technologies such as to optical coherence tomography (OCT), photoacoustic imaging offers much great depth penetration because the ultrasonic scattering coefficient in tissue is two to three orders of magnitude less than the optical scattering coefficient. This combined with the fact that unscattered or scattered photons can trigger the photoacoustic signals can generate the photoacoustic effect, allows for imaging as deep as 7cm below the surface as opposed to the typical 1mm penetration depth from OCT. Therefore, photoacoustic imaging is uniquely capable of generating 3D topographical images deep below the skin without the need for dyes or other biomarkers. By combining these two properties of the photoacoustic effect (molecular specificity and depth penetration) tunable OPO based photoacoustic imaging provides another tool in a biomedical researcher’s the ever-growing toolkit of laser-based techniques. To implement this technique, a high quality tunable pulsed laser is critical, and one source which is ideally suited for the challenges of this technique is the Q-Tune by Quantum Light Instruments. 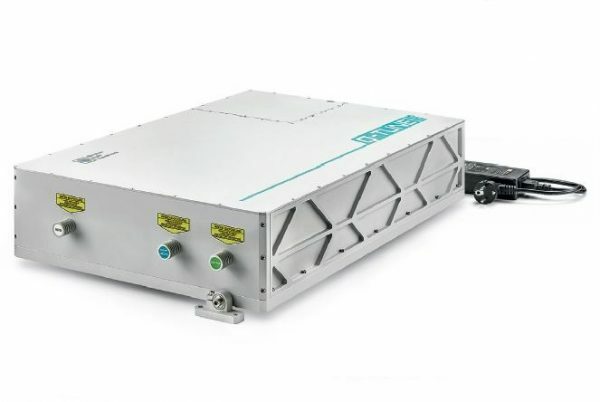 This tunable DPSS laser system provides five ns duration pulses with up to 5 mJ of pulse energy with a variable pulse repetition rate from single shot to 100 Hz and a tunability range from 410 – 2300 nm. Even though the optical properties of the Q-Tune perfectly fit the requirements of photoacoustic, the most significant advantage of this system for biomedical researchers is possibly is its ease of integration because it is self-contained with no need for external chillers or large power supplies. The Q-Tune’s advanced laser design with microprocessor-controlled operation with self-optimization, self-calibration capability results in a compact, user-friendly turnkey system with hands-free automated tuning, therefore, you do not need to be a laser expert to operate the unit. Upon request the optional extensions available to increase the tuning range down to 210 nm, fiber-couple the laser output and integrate a miniature spectrometer for real-time wavelength monitoring. For additional information including detailed technical specifications on these lasers click here or talk to one of our laser experts today by calling 1-636-272-7227.